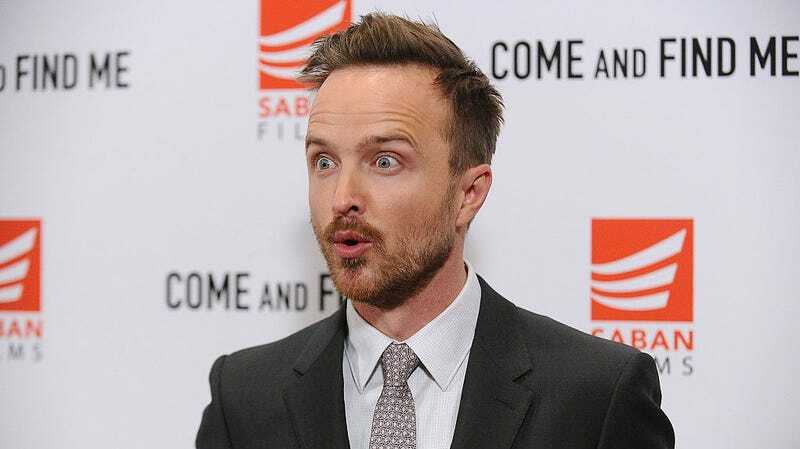 Before Aaron Paul was a famous actor known for his roles on Breaking Bad and BoJack Horseman, he was just like the rest of us: desperate for a chance to appear on the gilded sound stage of The Price Is Right. Unlike those unfortunate souls who never got their chance to Plinko or Punch a Bunch their way to glory, though, a young, still-unknown Paul fulfilled this dream. His appearance, we’re happy to report, is readily available online for your viewing pleasure. Before he ever portrayed energetic young meth dealer Jesse Pinkman on Breaking Bad, Paul was apparently just an energetic young man with dreams of free cars and a head full of MSRPs. Shades of his breakthrough role are clear as he bounces down to the podium, nearly levitating at the success of his Contestant’s Row showing and screaming himself hoarse when he gets a chance to shake hands with Bob Barker. The Price Is Right has a long history of super enthusiastic contestants, and Barker handles the young Paul like an absolute champ, neither patronizing or balking when a strange man yells at him, “You’re the man, Bob! You’re my idol!,” eyes bulging behind a set of Y2K-era, minimally-framed, oval-shaped glasses. Though the clip sees Paul painfully losing the Showdown, modern viewers can at least take heart, knowing that this devastation is only a speed bump on the road to further success. Where this appearance ranks in Paul’s varied pre-Breaking Bad career is hard to say; in his younger days, the extremely eager actor also appeared on television in everything from a horrific Korn video to a Corn Pops commercial. Though these maize-heavy opportunities surely helped Paul on the path to success, none seem to have made him quite as happy as a shot at gameshow riches, making his The Price Is Right spot the crown jewel in the many riches of his pre-fame past. No matter how good, the rest of this period of work absolutely pales in comparison.